This product is available at a 20% discount when you purchase it together with the RL version. Here is the link to the bundle. This product can be used with any reading series, program or un-program...for the schools and classes out there doing a home-grown reading "un-program"... this product is ideal! This product marries the reading and writing demands of the Common Core as students must do more "writing about reading" than ever before. 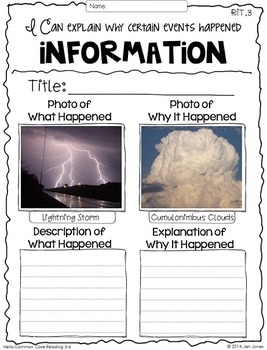 These sheets give students daily practice in writing about reading and justifying their thinking with text based evidence. Whether you teach reading comprehension through a Daily 5 or Reading Workshop structure, or even a basal series, this comprehensive CCSS Reading Informational Text (RIT) bundle of reading response resources will supplement every standard you teach in the Reading Informational Text (RIT) strand of the Common Core. This set of reading response sheets for each standard was tailored specifically to the 3rd, 4th, 5th and 6th grade Reading Informational Text standards. 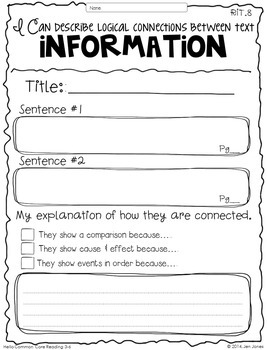 Use these sheets during your mini-lesson as models of how students can organize their reading thinking and show their comprehension and understanding of fiction, and create your own anchor charts out of many of them. They can be used whole group, small group, during independent reading time, at a literacy station, as homework or even as an assessment. Corresponding standards are clearly indicated in the upper right corner of each sheet so you know which response sheet goes with which CCSS. All page headers are written in the “I Can…” language of the standard. 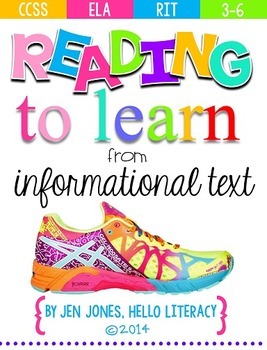 This product also includes 20 Mentor Text Lists that indicate ideal books for teaching various reading comprehension skills, strategies and standards of RIT standards 1-10. There are over 400 common core aligned, cute-to-boot, reading response sheets, graphic organizers and reading activities to teach and learn all Common Core State Standards for Reading Information Text in grades 3-6. This packet is by far the largest and meatiest, most comprehensive of all of my bundles...I really tried to eliminate and delete but there's just a lot to cover AND I have found that not all students enter a grade level ON grade level with every standard, so I often have to dip down to the lower grade, or lower, to build their understanding and profiency of the standard, hence you will see a lot of differentiation within one standard. Mentor Text Lists are included and are suggestions. These are groups of titles that I have compiled based on books that have worked for me in teaching different comprehension skills, strategies and Common Core standards. *Please take a look at the 18-page product preview to see full page samples of the reading response sheets and graphic organizers included in this product, appropriate for 3rd grade, 4th grade, 5th grade and (elementary) 6th grade. Please note there are over 400 sheets just like this included. This product is light on the narrative and mostly the actual printable. * (This product is one file, one easy PDF download...but you'll need to latest version of Adobe Reader to open it.) This product is a single user license. The RL 3-6 version is available HERE. The K-2 versions are available HERE. Thank you for looking, adding to your wishlist or purchasing! I appreciate your feedback! And if you do find errors, please follow the TpT Guidelines and let me know so I can fix it, at the Ask a Question Tab, before leaving negative feedback. 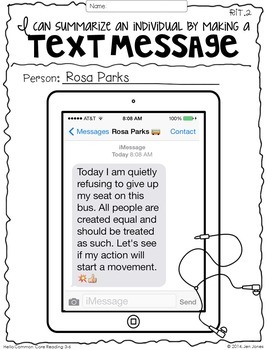 © 2014, Hello Literacy, Inc.| All Rights Reserved. Common Core RIT: Reading Comprehension Sheets for 3-6 Informational Standards. Permission is granted to original purchasers to reproduce material as designated only for their own classroom use. No other part of this work may be reproduced in any form or by any electronic or mechanical means including information storage and retrieval systems without permission in writing from the publisher, except by a reviewer, who may quote brief passages in a review.